You are here: Home / Ent. / The Left’s Race-Card Hustle; Chris Matthews Hating On Musical Genius Kayne West. The Left’s Race-Card Hustle; Chris Matthews Hating On Musical Genius Kayne West. (ThyBlackMan.com) As is often the case in this era of President Donald Trump, the reaction is far more interesting than the action. Most nights, Chris Matthews and his left-wing cable colleagues scramble to come up with new and different ways to call Trump “racist.” They argue that Trump knowingly and intentionally crafts his message to appeal to white racists. On election night, CNN’s Van Jones attributed Trump’s victory to “whitelash” – claiming that “racist” white voters found a kindred spirit in “racist” Donald Trump. But Matthews, in an unguarded moment, conceded that most whites would not vote for somebody if they thought he or she was racist. Fatherhood doesn’t need to be a Political Issue. If you need (motivation) to be a decent father you should be sterilized. Religion may be important depending on opinion, but it shouldn’t be needed to be a good, charitable person. I have a different take on what Kanye may be doing. He may be doing things his way and not the typical way a person who would oppose Trump would. Kanye has a platform to do so. Would Trump listen to him if he came to him as an enemy? Most likely not. Kanye has talked about moving back to Chicago. I guess to try to help out there. Kanye talked about prison reform. So lets see if any of those things happen. Remember what he said about Bush and Hurricane Katrina. Did Bush open the door of the White House to him? Did President Obama? 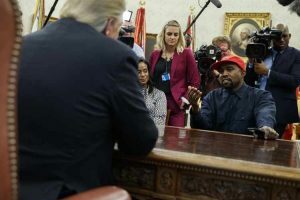 Maybe Kanye thinks that “Making American Great” will include more African Americans – for real and for the first time. Also, just maybe Kanye is following the old mafia saying I guess – “keep your friends close but your enemies closer”. And keeping the end goal in mind – better opportunities for African Americans.